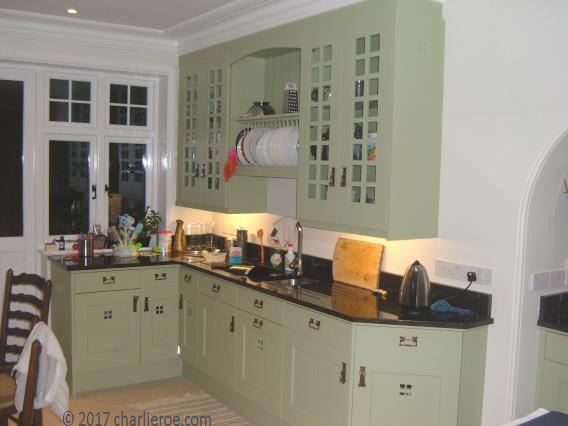 Another stunning Arts & Crafts kitchen, for a customer in N. London. We re-designed the main rooms on the ground floor in the Arts & Crafts style. The living room & entrance hall were equally impressive, being based on Philip Webb's house Standen. The main design influence for the kitchen came from CR Mackintosh's Hill House, with some Mission style added to the mix. The green painted finish was influenced by Wm Morris & Philip Webb's use for various schemes, inc. Standen. 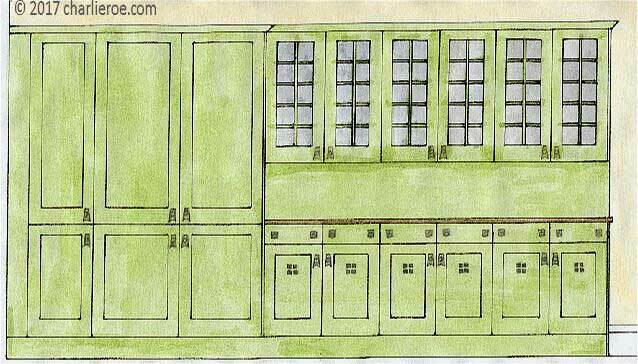 The kitchen was a tricky shape, being medium length & narrow, with a large alcove. The kitchen was extended by the customer to give a long narrow room. 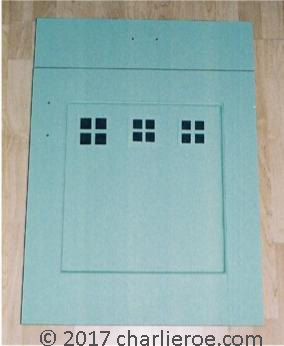 We designed a new garden door with windows either side. The window fanlights were divided into squares to tie in with the new kitchen furniture. The following photographs show the kitchen before & after for the various units. From these you can also appreciate the mess involved in installing a new kitchen. The room was stripped bare, then plastered. The kitchen had to be installed before any decoration took place, because the furniture was built-in to the ceiling, and a new cornice added around the room, to tie everything togethered visually. You can see how tricky the alcove was to plan. A nice touch was to angle the end unit & stone worktop, to allow for easy movement between the alcove and sink area. 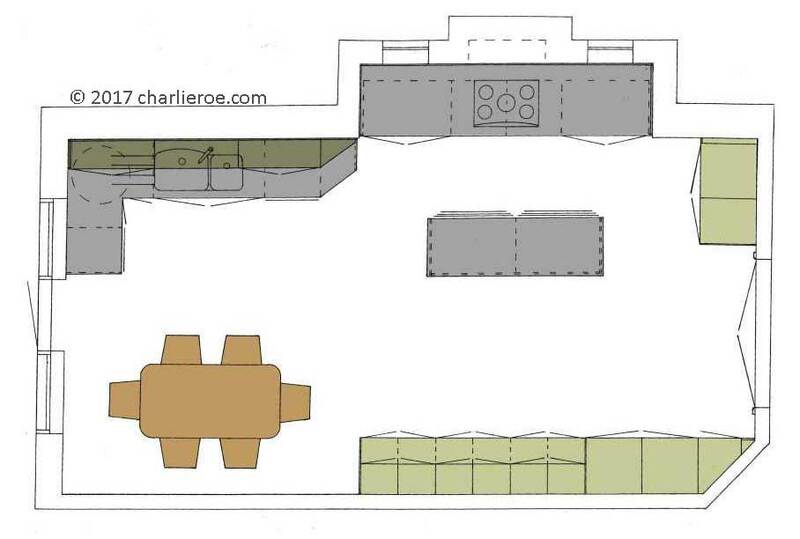 An island was added for extra storage & preparation area. The island had to be kept quite narrow to allow good access to & from the room. 2 tall units were added to the back corner, where they couldn't cut out light in the kitchen. These included an integrated freezer & a tall pull-out unit. Again the tall units were positioned in the far corner, to avoid cutting out light in the kitchen. They included a tall integrated fridge & another tall pull-out unit, which give maximum storage. 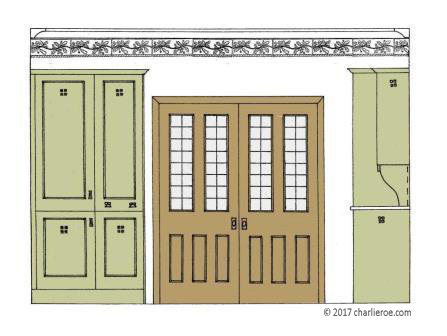 The base & wall units of this run are very much based on CR Mackintosh's kitchen for Hill House. The latticed doors of the wall cupboards form a series of squares, picked up in the cut-out details on the doors & even in the door handles. 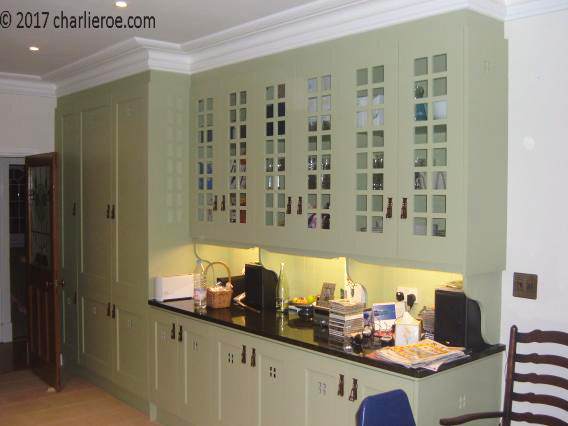 We supplied the customer with several versions of the green paint for the kitchen. We also mocked up 3 different sizes for the 4 square hole detail in the doors (the middle photo shows all 3 on 1 door to show their scale). This made it very easy for the customer to choose from. 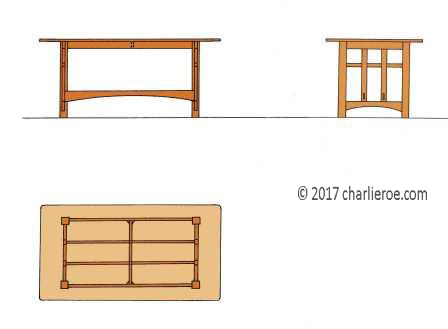 The middle photograph shows the Arts & Crafts Mission style door handle used for the furniture. For further examples of handles see the main Arts & Crafts index page. You cannot underestimate the difference good quality well designed handles make to a kitchen. 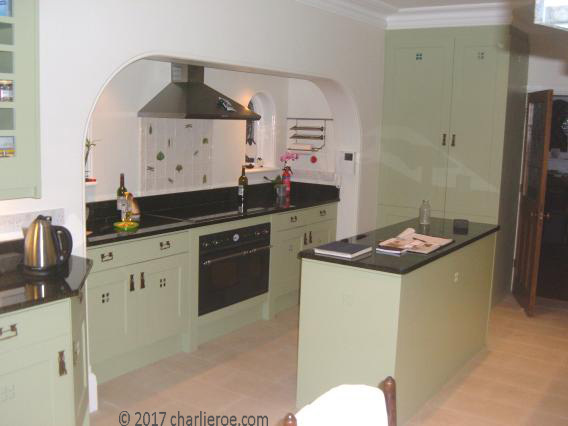 We also designed new kitchen doors, and matching doors for other rooms, with a stained glass panel in the top ( the stained glass was similar in design & colours to the 2 stained glass windows in the alcove. As always, the devil is in the detail. Even the low voltage ceiling spot lights were square in shape! 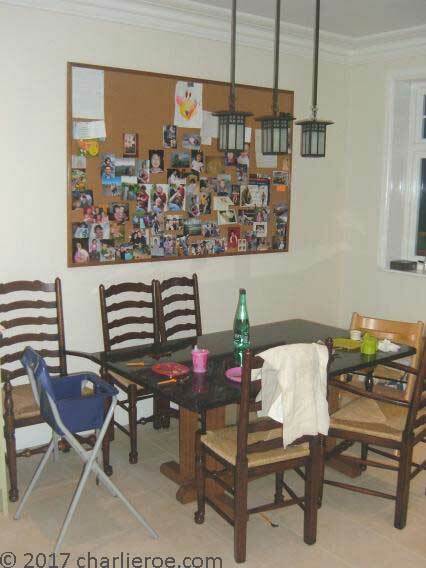 The runs of furniture along one side wall was stopped short to allow room for a dining table & chairs.